This calculator computes the equivalent lens focal length to produce the same field of view between two cameras with different aperture/sensor sizes. It will do a “Match Lens” calculation, and produce the closest equivalent angle of view lens, in millimeters, for both vertical and horizontal frames, between the original camera’s focal length and the current camera’s focal length. MatchLens is slanted toward the professional movie industry, covering 16mm, 35mm and high definition video formats, but also covers an extensive list of professional DSLR’s and consumer point-and-shoot digital camera formats, which can be matched across all standards: motion picture film, video, and still photography. For example, you are scouting a film location with a still camera, like a Canon PowerShot SD500 (7.17 x 5.3 mm sensor) and you want to evaluate what lens is needed to achieve the same field of view with a High Definition Sony F-35 (26.6 x 13.3 mm sensor). In MatchLens, you input the information from your original camera by simply choosing the FILM, VIDEO, or STILL button, then selecting the camera format from the scrolling list. Then repeat for the current camera. Next, you enter the focal length from the original camera. 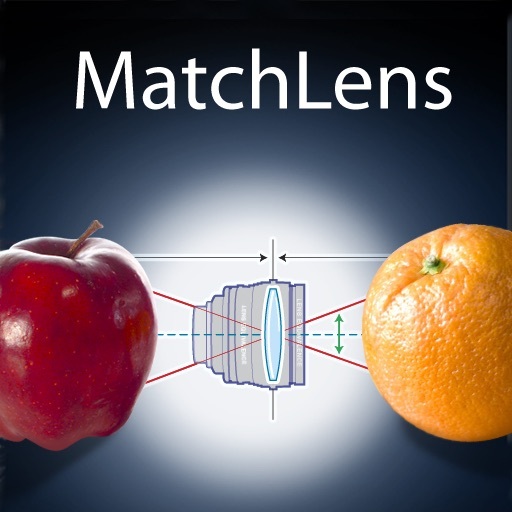 MatchLens will compute a comparable focal length for the current camera. Note on still camera formats: Most still camera formats/sensor sizes are represented in MatchLens’s scrolling list, though not every brand name is mentioned. Sensor sizes are somewhat standard and are shared by many manufactures. I If you don’t see your camera listed by name, check on-line with the manufacture, or in your manual, to determine your camera’s sensor size. 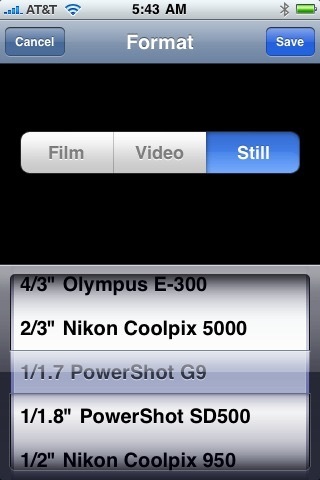 Select that sensor size in the scrolling list, regardless of the camera’s brand name. 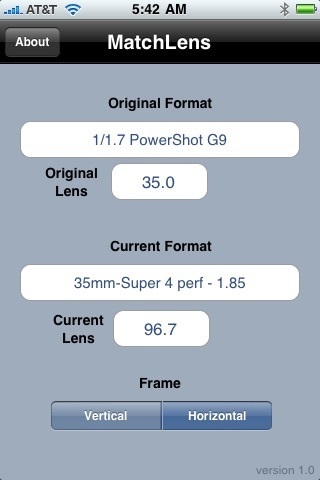 Super 35 mm Full Ap.